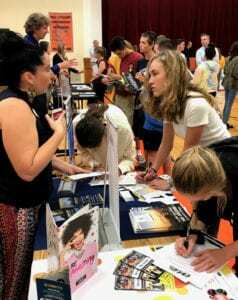 On Thursday, September 13, New Lebanon 11th and 12th graders participated in the fourth annual College Caravan sponsored by the Capital District Counseling Association. Students had the opportunity to speak with admissions counselors from various two and four year universities across the region. Prior to the event, school counselor Mrs. Evans and English teacher Mrs. Dickson co- taught a lesson to prepare students with questions to ask the college admissions representatives. The kids really took advantage of this opportunity, and we look forward to doing it again next year!